We have had our fair share of dogs, cats, birds, a ferret or two, mules, and horses who have stayed with us at Pheasant Field B&B. Tonight we have our first goat travelers at our B&B! These are dwarf kids who will be show animals and dairy goats. Right now they are just so cute! Two of the three dwarf dairy kids and their new "mom" who is taking great care to keep their feed and even their water the same to minimize disruption as they make the journey home to Georgia. These kids are going to their new homes in Georgia and Florida where they will impress everyone with their great breeding lines and just by how darn cute they are! Some of our visiting critters are not domesticated - like these herons which were lost in their dance with each other and did not realize how far they were from the pond or how close they were to the road. Fortunately, they were alerted when the flash went off in my camera. They flew off safely back to the pond. This shows just some of the great bird watching opportunities here at Pheasant Field B&B. This Rhodesian Ridgeback was actually bigger than the dwarf goats now visiting with us. And this girl was so well trained and such a lady! We are seeing progress on our solar project. The lines for the water are in and are bring attached to the solar collection tubes. The lines have been run into the house and will be ready to hook up Friday or Monday. 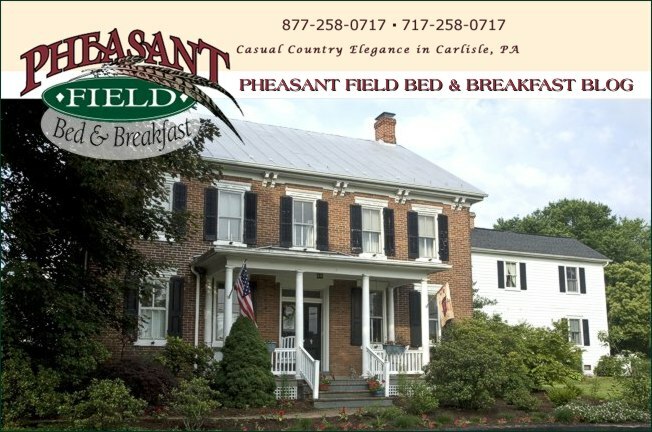 We are growing "greener" at Pheasant Field Bed & Breakfast!